Digitally encoded and analogue (unencoded) operation coupled with straightforward operability result in very secure use. 2x primary network, 2x secondary network, 1x emergency channel. Developed in line with the military standard MIL-STD-810E. 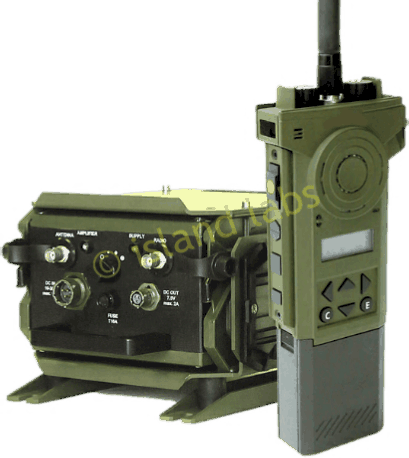 We have developed the Radio module for “RT-405 Pentacom” (TFF-41-0) VHF handheld military radio set. 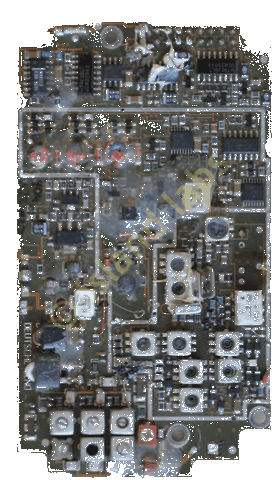 The RT-405 (TFF-41-0) Pentacom is a military handheld digital radio set, the result of a joint development and production effort with Deutsche-Elno, Island Labs and Ascom Systec Ltd. Its main features are simultaneous operation on five static frequencies and encryption. The contractor claims that the radio is easy to operate. Hostile interferences are countered by automatic channel selection. 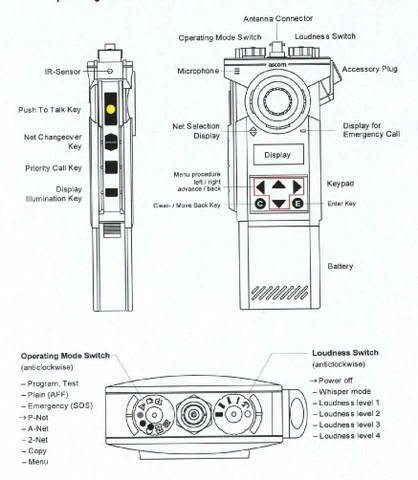 The RT-405 supports simultaneous, redundant operation in two networks, an emergency call function, priority calls, and the use of repeater stations. Encryption keys can be generated in the field and communicated to other Pentacom radios via an optical interface, along with other device settings. Interoperability with other VHF radios is possible in clear mode. The radio has a range of 6 to 18 km depending on antenna and amplification chosen. At a transmit/receive/standby ratio of 10/10/80 percent, the Pentacom has about 20 hours of autonomy. The average operational range is 6 km, but a higher operational range is available with a 25 W booster (PA-405). 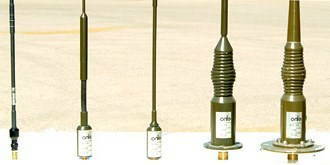 We can supply a variety of different antennas and other accessories. Introduction to the intended use: soldiers and security staff who have to be able to react flexibly and quickly to changing situations require a suitable communications infrastructure to ensure their coordination and to perform their mission. Hand-held radio sets are practically indispensable in situations in which all those involved require maximum mobility and the quick exchange of information: these conditions include surveillance and management tasks in the event of critical operations. This equipment must be easy to use yet be technically advanced and versatile to provide troops with the advantage they need to complete their mission both successfully and safely. The "RT-405 Pentacom" hand-held radio set combines all these features, enabling it to comply with today’s demands. It is already used by the German and Austrian armed forces, within NATO countries as well at international level. It is one of the most state-of-the-art military radio sets available today. Operator errors are practically impossible! Fast and easy operation via PTT button (push to talk). All settings of the operating functions (frequencies, keys) are stored in internal non-volatile memory. Two radio networks can be used simultaneously, including in a closed network only if desired. It is possible to generate codes spontaneously for tap-proof communication. Data can be copied from handset to handset (cloning) without the need for cables or a filling gun. Repeater function: no planning, no preparation. Interoperability with other analogue VHF radio networks. The following explains just a few of the features: more detailed information available upon request. Normally only the push-to-talk (PTT) button needs to be activated for even beginners to communicate reliably. In basic mode, the settings for frequencies, codes, etc. are locked and cannot be accidentally changed; this avoids operating errors. Are available under the relevant operation modes and are easy to use once the operator has acquired the necessary knowledge. Depending on the organisational conditions, the device can be operated in pre-selected networks. Relevant IDs are used to identify the individual radio networks. It is also possible to spontaneously generate field codes for highly sensitive communication tasks and only be given to certain subscribers using an infrared interface. Either specific data (e.g. code only) or entire configuration settings can be transmitted easily without the use of any further aid such as fill gun or cable. In the clear analogue mode, it can communicate with other VHF radio sets. Instead of communicating in two different networks using two separate devices, Pentacom makes it possible to communicate in two different networks using one device. Radio communication can be heard simultaneously on both networks. Before transmit, the main network must be selected. The Pentacom hand-held radio set is optimised for military use and all security forces: high-security requirements and functionality are combined with easy operation. Together with the Range Booster and the comprehensive range of accessories, it is an integral system that leaves nothing to be desired. Download our trade fair poster: the poster is an exemplary depiction of some of the important functional features: more detailed technical details and unique models, designed in line with customers’ specifications, are available on request. The Range Booster PA-405 complies with all relevant quality standards, such as full bandwidth, linearity, temperature stability, small, robust design, etc., making it into a high-quality amplifier which can mainly be used with various radio sets. Also, it has been designed to comply with military handheld radios "Pentacom" with regard to optimal performance. This makes it the perfect accompaniment for the Pentacom radio set, particularly when it comes to being installed in vehicles and in the field. 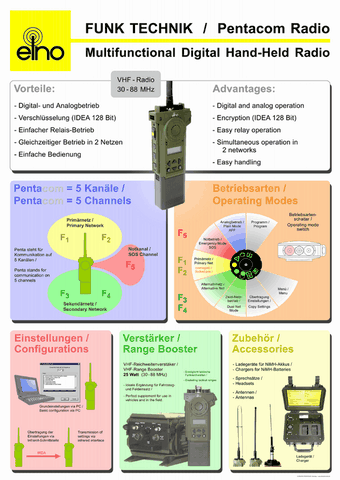 The “Pentacom radio set” (amplifier and radio set) is integrated into the Austrian Armed Forces’ Dingo armoured vehicle, for example. Together, they form a cost-effective VHF System with tactical range, in which all the functions of this particular digital radio are supported, including simultaneous dual-band operation. The amplifier can also be used in any radio equipment covering the 30 MHz to 88 MHz frequency range and is available with power outputs of either 5W or 25W. Island Labs offers an extensive selection of antennas for professional users in HF, VHF, and UHF spectrums. The product line ranges from flexible short antennas for handheld radio sets and vehicles to stationary transceivers with aerial masts 10m high.